A foreign patient receives a life-extending organ transplant in a Chinese hospital. Feeling grateful, he asks a hospital staff member who the donor was so that he may give thanks and repayment. But no one at the hospital—not even the transplant doctor—knows the donor’s identity. Before his flight home, the patient is issued an official transplantation document. He finally learns the identity of his life-giver: A 30-year-old male death row convict. Coincidentally, all the other transplant patients received organs from healthy, 30-year-old executed prisoners. Only their names differ. A correspondent who identified him or herself as having worked at the Tianjin First Central Hospital in the mid-2000s recently recounted the above episode and other oddities in a personal statement provided to New Tang Dynasty Television. Below is a translation of the statement, edited for brevity and clarity. When China was welcoming large numbers of foreign organ transplant patients, I stepped into Tianjin First Central Hospital’s organ transplant center on the seventh floor. I managed to get a job at the transplant center through a recommendation. 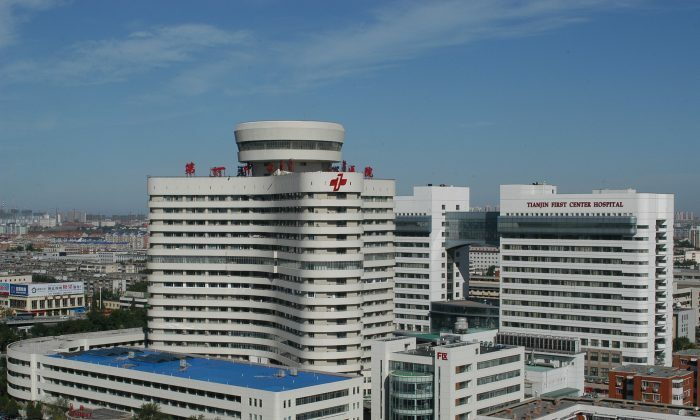 Tianjin First Central Hospital was then also known as the Orient Organ Transplant Center because it handled large volumes of organ transplant patients and was located in China. Today, this hospital is still the largest center in Asia. The world of organ brokers is a black box — but from my contact with that world, I’ve figured out that there are a number of channels for people to learn about or get organs. One channel is through middlemen. A well-known South Korean doctor with one of the biggest hospitals in South Korea would introduce his patients to a middleman. This middleman would then refer these patients to the Tianjin hospital. There is no diplomatic arrangement for organ transplantation between China and South Korea. Rather, intermediaries belonging to Mafia-like syndicates cut transplant deals. Many of the foreign transplant patients came to China looking for a liver or kidney. The bulk of these foreigners were South Koreans, while the rest came from Japan or Taiwan. Foreign doctors are another channel for organ transplants. Because there was a shortage of transplant doctors in China, an unnamed hospital hired a South Korean doctor on high wages. This South Korean doctor told me that his peers in China held two household registration (hukou) credentials—one South Korean, and one Chinese—and that he is a legal Chinese citizen. I don’t know how much Chinese blood these dual-national South Korean doctors have on their hands. A third channel is Chinese commercials. These ads feature famous Chinese celebrities, and serve to deceive and entice potential patients. A South Korean patient I keep in touch said that his countrymen flocked to China after watching an organ transplant advertisement starring Chinese actor Fu Biao. On Aug. 26, 2004, Fu Biao checked into Beijing’s 309 Hospital for a check-up. The following day, he was diagnosed with liver cancer. On Sept. 2, Fu received a liver transplant at the General Hospital of the People’s Armed Police in Beijing. The chief surgeon operating on Fu was Dr. Shen Zhongyang, a man hailed by the Chinese media as China’s “top scalpel.” Dr. Shen had headed the organ transplant research institute at the People’s Armed Police Hospital and the Orient Organ Transplant Center in Tianjin First Central Hospital. In April 2005, Fu suffered a cancer relapse. He had a second liver transplant surgery on April 28, and was once again operated on by Dr. Shen, though this time at the Orient Organ Transplant Center. On Aug. 30, however, Fu Biao passed away. Afterwards, a person provided a tip on the sourcing of actor Fu Biao’s donated livers—two Falun Gong practitioners from Shandong Province. Dr. Shen had killed the practitioners for their organs. Although Fu might have only lived a year more after his two liver transplants, his organ transplant advertisements continue to be broadcast in South Korea. Thus, South Koreans still visited China for surgery in 2006 because they, unlike the Chinese, didn’t know that Fu Biao was already dead. Those in need of a liver transplant around the world have fallen victim to the Chinese Communist Party’s enormous deception. A South Korean patient once told me that Chinese doctors learned organ transplantation techniques from the technically superior Japanese doctors. When I was at the Tianjin organ transplant center, the hospital staff were familiar with a professor Zheng, a specialist in liver transplants, and a professor Song, a kidney transplant specialist. They were considered the best transplant surgeons in their respective fields, and both had learned their craft in Japan. The two professors didn’t appear to be working for just one hospital—one day they’d be performing surgery in China, and the next day they’d head off to Japan or some place else. At the Tianjin First Central Hospital, doctors perform transplant surgery in groups of three. I’m not sure how many surgery groups there are. These doctors work night after night, while hospital translators wait with the relatives of patients in the hallways. A liver transplant can take up to 10 hours. Why did foreigners, particularly South Koreans and Japanese, journey to China for organ transplants, I asked professor Zheng and professor Song. They told me that while they had superior transplantation skills, they weren’t able to find organ donors within a very short time frame in the aforementioned Asian countries. For instance, the waiting time for an organ in Japan or South Korea could be as long as 10 years, or five to six years at the earliest. Some patients pass away while waiting for an organ because acquiring one isn’t easy. The professors added that everyone in their medical teams and their patients know about the organ waiting time. So, many foreign patients end up traveling to China because there appear to be many Chinese organ donors. Most of the patients I met at Tianjin First Central Hospital were in need of either a liver or a kidney. Unless the patient suffered an organ rejection, they would be discharged after a short residency period. Under normal circumstances, patients would receive an organ in two days, while some waited anywhere from 10 days to half a month—patients said that this was too fast. A South Korean patient had the longest waiting time of those I’d met—a whole month—and happened to be at the Tianjin transplant center when the Chinese Communist Party’s live organ harvesting scandal was being exposed. After a spending a month in Tianjin, the hospital told the patient to travel to the city of Wuhan in central China for a transplant, and we immediately flew over. I didn’t know that an organ transplant network actually existed. The surgery in Wuhan was very successful, and the patient and his family were very satisfied with the result. Before they returned to South Korea, the patient and his wife—a person of faith—asked who the donor was. The liver transplant had cost him a sum (around three hundred thousand to five hundred thousand yuan, equivalent to $45,000 to $75,000), the patient said, but it was the donor who allowed him to regain his health and extend his life. “I want to know who donated the liver so I can thank the person’s family and give them money or whatever they need. I’m truly very grateful,” the patient said. At the time, there was no way for the hospital staff to know where the organs came from. Also, we were warned before being hired that we shouldn’t go sniffing around or indulge in loose talk with patients. But I wanted to fulfill the South Korean patient’s last request before he left for home. Of course, the patient didn’t know that we were prohibited from snooping around, and I shouldn’t have been asking questions, but I spoke to the patient’s transplant doctor anyway. I relayed the doctor’s reply to the patient and his family, and they were very taken aback. The patient said that international laws regulate the transfer of organs. By these laws, the organ donor and his family are required to sign organ transplantation documents. Without proper documentation, transplant doctors are liable for punishment. In South Korea, everyone knew who their organ donor was because the information has to be made public by law. Before leaving the hospital, the South Korean patient said that the hospital needed to give them an official document that indicated that he just had surgery and the organ that he had received, as well as the donor’s personal information and signature. Without this document, the patient wouldn’t be able to board a plane. I escorted the patient and his family to an airport. They and other organ transplant patients were made to board a special double-decker aircraft instead of a commercial plane. Finally, the organ transplant patients were issued transplantation documents which stated that they had received their organ from a 30-year-old male death row inmate. Only the names of the executed prisoner differed. At the time, I wasn’t aware that the organs these foreigners had spent large sums of money to purchase came from Falun Gong practitioners. Many of us were too naive, and didn’t imagine that those blinded by money had in fact been brainwashed by the Chinese Communist Party. One after the other, angels clad in white transformed into murderous devils. Knowing that such things cannot be allowed to continue, I quit my job at Tianjin First Central Hospital. Afterwards, I obtained information about the live organ harvesting of Falun Gong practitioners through various channels. I did what I had to do, and exposed the truth to the world so that those with a conscience can free themselves from the devil’s grip. Recently, the United States House of Representatives unanimously passed H.Res.343, a resolution calling on the Chinese regime to immediately cease the harvesting and trafficking of organs obtained from Falun Gong practitioners and other prisoners of conscience. For the past 17 years, Falun Gong practitioners—individuals who live according to the principles of truthfulness, compassion and tolerance—have been subjected to hundreds of inhumane torture methods, including the atrocity of organ harvesting. This must be stopped immediately, and shouldn’t be allowed to implicate the rest of humanity. It is the responsibility of every Chinese person in the mainland and abroad to see that live organ harvesting is ended. Translation by Frank Fang; editing by Larry Ong.